Apps, Tools, and "Jobs to be Done"
If you're an employee you were likely hired to do a specific job. If you're a freelancer you're hired all the time to do various types of jobs. The concept of hiring a person or a company to provide some kind of service is about as simple as it gets when thinking about economics. However, have you ever thought about the "job" of everything else around you? Horace Dediu, host of the excellent podcast, The Critical Path, and website, Asymco, often talks about "the job" something (not someone) is "hired to do" (and I think this idea originally came from his advisor, Clay Christensen). I like this question and I think most of us could benefit from aiming it toward the tools and software we use on a daily basis. What are the "jobs to be done" in your business or life and are you "hiring" the right tools to do those jobs efficiently and enjoyably? Asking this question can help in two different dimensions. First, it ensures that you're not trying to use a tool for more than what it's actually good for. Second, it helps you determine if the tools you're currently using are actually the ideal tools for the jobs that be done. Let's look at both scenarios. In the first scenario you're trying to hire a tool to do more than it's really capable of. I most commonly see this when it comes to task management, tools for storing reference information, calendars, and email clients. Each of these tools have very distinct uses and when they start to collapse together the result is often frustration and inefficiency. For example, I'm a huge proponent of never putting anything on my calendar that isn't a "hard landscape" activity (anything that involves me being somewhere or doing something at a specific time). That means to-do items and reference information never lives on my calendar. If you find yourself trying to schedule time to work on specific tasks or projects and never actually keeping that commitment you're experiencing what it's like to have your task management system bleed into your calendar. Another example of hiring a tool to do more than one task unsuccessfully is treating your email inbox like a to-do list. This almost never ends up in a happy place. An email inbox is great for holding onto discrete and varied pieces of information in one place until you get a chance to decide what to do with them, but it's pretty terrible at storing tasks. 1. Conduct a "job" audit: Try brainstorming all the various "jobs" you have to hire tools for to keep your business and life running. Pretty much everyone will have to hire for jobs like "keeping track of appointments," "keeping a list of ongoing tasks," and "sending and receiving emails," at the very least. What other jobs do you have that are more unique to your work or life situation? For me, I have to hire a tool to help me collect money from coaching and consulting clients as well as a tool to keep all my notes from clients in one place and easily retrievable. I'm sure you're work situation has some unique "jobs" as well. 2. Conduct a "tool" audit: Make a list of your 10-15 most used tools/apps. Go through the list and write a "job description" for each one. What do you use each of these apps for? If you get to the end of the list and you've written two almost identical job descriptions then you might be able to combine those two tools into one. On the other hand, if you've written some epic job descriptions because you use some apps for far more than they're designed to do then you might want to consider spreading some of the responsibility around to some other single-purpose tools (this is arguably a matter of personal preference, though, so if you're happy with how you use an app that should be the most important criteria -- I just happen to prefer single-purpose tools over multi-purpose). 3. Identify areas for development: Between the job audit and the tool audit you've probably identified some areas for improvement. Now's the time to do some research. I would start with websites like The Wirecutter or The Sweet Setup to get a sense of what people who review this stuff for a living think about what's best before just diving into the never ending sea of potential tools. I also recommend setting some kind of limit to how much time you'll spend identifying and playing with new tools. I like to take a little bit of time every month to focus expressly on making sure the tools I'm using are still the best tools for my needs. Once you've determined you've hired the best tool for each of the jobs you need to complete then you can focus on learning how to use those tools as well as possible. For apps, that means learning the ins and outs of their settings, keyboard shortcuts, and integrations with other apps. For example, I'm very comfortable that Things is the best task management software for me. Therefore, I've invested the time to learn all the keyboard shortcuts that make it even more useful for me as well as doing things like connecting it to Reminders on my iPhone so I can use Siri to add items to the inbox and connecting it to Dispatch (email app for my phone) so I can easily connect to-do items in Things to the emails they reference. 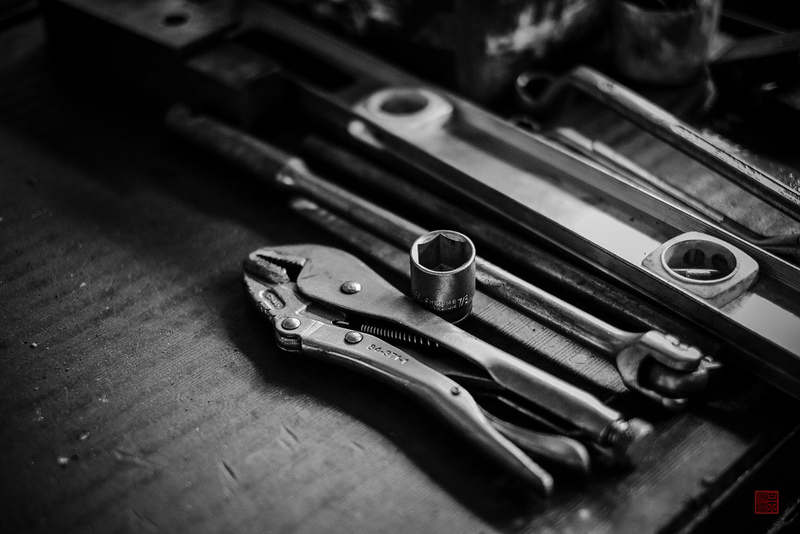 Deciding that a certain tool is the best one for you allows you to use the energy you might've used to constantly be looking for something else on actually learning the tool at hand as completely as possible. It's a good feeling. What jobs in your life still need you to do some hiring? Which old hires are sleeping on the job? Which tools have you given too much responsibility and which tools have you given too little? I've created a Facebook page for The Workologist where I share little snippets of information and inspiration that never make it to the actual website. Check it out if you've hired Facebook as a useful tool for a job you need done! Also, in case you missed it from last week, my en*theos class on How to Take Control of Your Indie Work Career is live!